Being a personal trainer in Dallas I get asked what my diet is on a weekly basis. My response is usually one of unprocessed whole foods that does include eating carbohydrates. Yes I said it “carbohydrates’ the most over vilified word in the fitness industry or carbs as they call them. I want to start off by saying right now get that out of your head that carbohydrates are bad for you because they are not. The whole no carb craze that is prevalent in the fitness/food industry is basically predicated upon processed or high glycemic carbohydrates. These are unfortunately the most abundant source of carbohydrates in supermarkets and many restaurants and almost all fast food establishments. I am here to tell you that not all carbs are created equal and processed starches are what you want to avoid like the plague. It is these types of high glycemic carbohydrates that are causing havoc on Americans health such as diabetes and obesity. The simple fact is if you stay away from processed carbohydrates like white flour and high fructose corn syrup and eat whole unrefined carbohydrates like brown rice and sweet potatoes then you are on the right path. One example of a processed high glycemic carbohydrate source would be white bread or refined wheat flour that is found in many common foods such as pasta. Another example of a high glycemic carbohydrate is high fructose corn syrup which is also in many common foods items such as soda and is widely used as a sweetener. 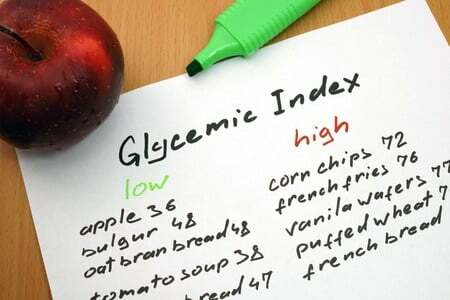 If your unfamiliar with what the glycemic index is then let me give you a brief rundown of how it works. 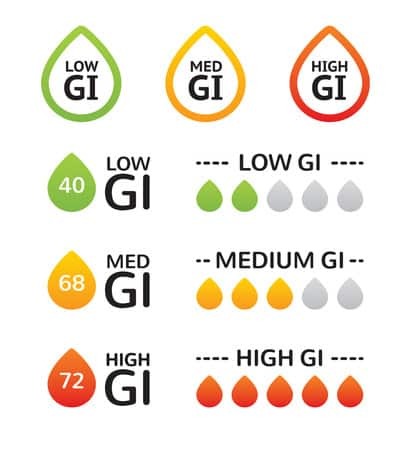 Basically the glycemic index is a number scale ranging from 0-100 that identifies how quickly carbohydrates are broken down by the body and converted to glucose from the time they are consumed. Glucose is basically the usable form of energy that your body derives from ingesting carbohydrates. Why does all of this matter to you? Because eating the right carbs at the right time can mean the difference between utilizing energy you give your body or storing the energy you give your body. What’s another word for stored energy people? FAT. Yes that’s it all fat is is stored energy. I’ll give you one common example of how this applies to your everyday life and why you should stick to low glycemic carbs. Most of my clients and I would venture to say most people in the US have a sedentary job such as working in office where you are sitting most of your day. 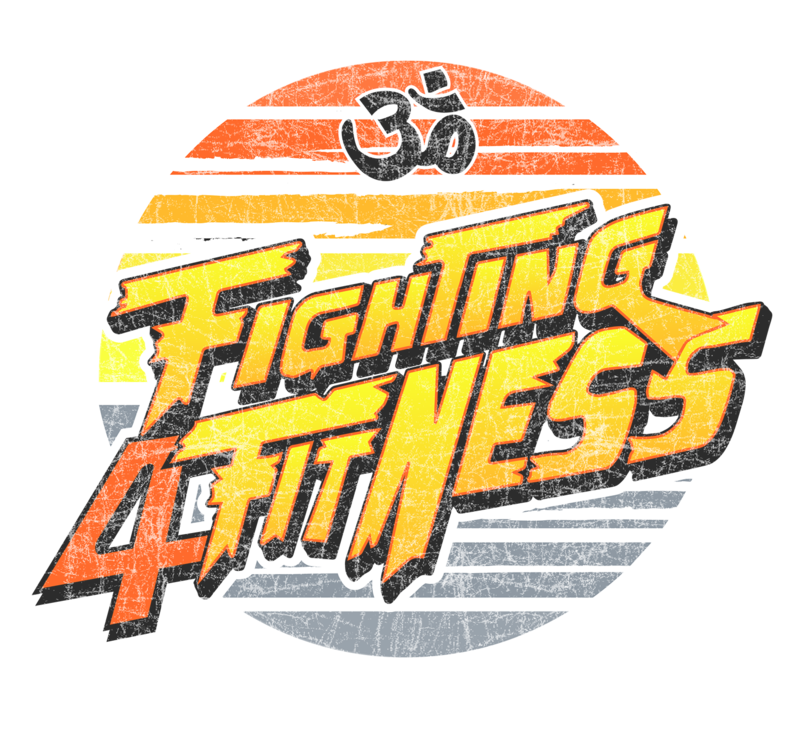 Let’s take that cheeseburger and fries you had for lunch and how the glycemic index applies. So you just had the high glycemic processed bread form the burger and then you had the high glycemic fries as most fries come from white potatoes which is almost the same as eating table sugar. Since these foods are high glycemic, your body will convert them to glucose rather quickly as I mentioned earlier. So your body just got this huge rush of energy (glucose) and your just sitting at your desk typing away for the next few hours until you leave for home. Since your body doesn’t need to utilize most of this energy as you are sitting down it will convert some of this glucose into fat as stored energy. Another negative byproduct of eating high glycemic carbs is your insulin will spike as this is your bodies mechanism to mitigate the effects of too much glucose in the bloodstream. If your diet consists of a large amount of high glycemic foods then this is what can lead to diabetes. On the other hand if you forego the cheeseburger and fries and choose to eat brown rice with some chicken and broccoli this will have the opposite effect. Even though you are still sitting down most of the day, the low glycemic brown rice you ate will breakdown much slower over time and gradually release the glucose into your bloodstream. Since the glucose is being released into your blood much slower, your insulin levels won’t spike and the energy (glucose) will be better utilized by your body thus having less of a chance as being stored or turning into fat. I am not suggesting that you go overboard with low glycemic carbs. You still need to control your portions as you can still gain weight from low glycemic carbs. I challenge all of you who are reading this to give this low glycemic carb diet for a month and at the end see if you haven’t lost some lbs. It’s not rocket science people it just takes discipline and a little know how with your diet and you can gradually transform your body.